What a start to the NCAA Tournament. This afternoon’s action represented the first game of the Round of 64 this year and it certainly did not disappoint. Regulation was marked by both teams trading punches and finding responses to stay within striking distance. Oklahoma came back to force overtime thanks to heroics from freshman phenom Trae Young, as the point guard extraordinaire scored the Sooners’ final 11 points of regulation to knot the game at 69. Rhode Island had a pair of chances to win it in regulation, but a Jeff Dowtin jumper rattled off the rim and Stanford Robinson‘s put-back attempt agonizingly fell off to force the extra period. 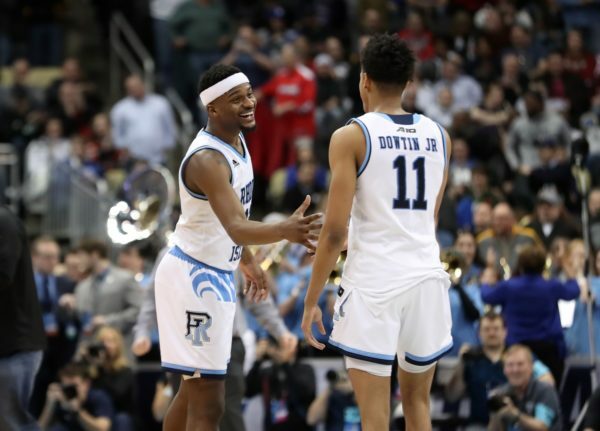 While Rhode Island was able to put together several strong possessions in a row and eventually pull away in overtime, this game was a strong reminder of what makes the NCAA Tournament such an exciting event every single year. E.C. Matthews carried Rhode Island in the overtime period. With Rhode Island trailing 72-71 and under two minutes to play, it went to its senior leader for a much-needed spark. E.C. Matthews buried a three-pointer with 1:52 left to give the Rams a two-point lead, and he followed that up by burying another one with 31 seconds remaining to give his team an insurmountable five-point lead. The Rams had to be disappointed that they had squandered a late lead in regulation, but a senior leader like Matthews ensured that his team was going to carry on and win the game in overtime. Leading up to Rhode Island’s Second Round game on Saturday, it is a near certainty you will hear more about the long and winding career of Matthews. This was likely Trae Young’s last college basketball game. If you have followed college basketball this season, you have certainly heard more than enough about Oklahoma’s Trae Young. In likely his final game as a Sooner, he turned in a very on-brand performance to support his certain All-America bona fides. Young finished the afternoon with 28 points on 9-of-18 shooting (3-of-9 3FG) to go along with seven assists and six turnovers. The best part of his performance, though, was that Young was really all Oklahoma had as an offensive option when it needed a big play. It was a benefit and a challenge which was pretty much the entire story for Oklahoma this season — and ultimately caused Lon Kruger‘s Sooners to go one-and-done in the NCAA Tournament. 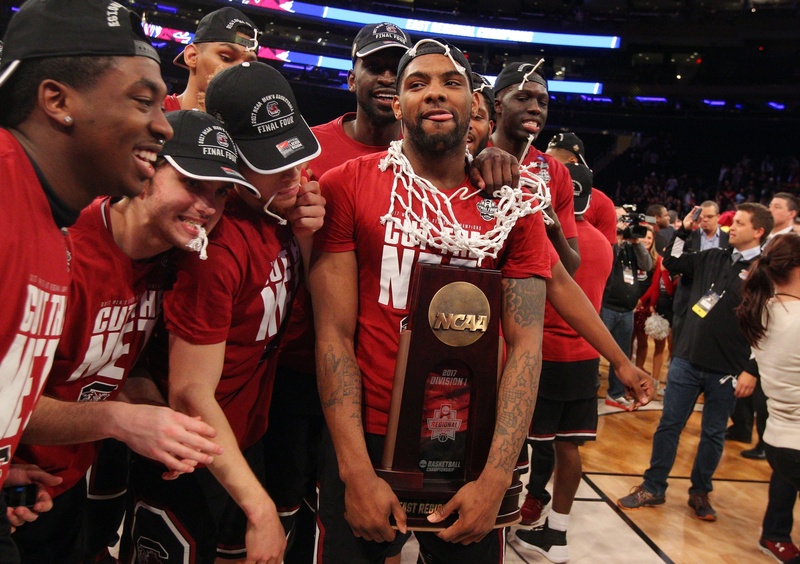 Young is an exceptional player who seems poised to have a lengthy NBA career, but it is somewhat a shame that he did not receive more assistance from his teammates during his tenure as the Sooners’ star point guard. North Carolina Won the Game in the First Half. A Gonzaga fan might argue that is when the Zags lost it. Irrespective of which team is responsible for what, though, the crucial stretch of the game occurred near the end of the first half. The Zags had opened up a seven-point lead on a Josh Perkins three — his third of the half — when Tony Bradley missed a subsequent shot on the other end. An offensive rebound by Justin Jackson led to a foul on Zach Collins — his second — and that’s when the Tar Heels began to make their move. Just like against Oregon on Saturday, North Carolina closed the gap to only three points by halftime, and then bridged the intermission with a run to take a quick second half lead. By the time the 19-7 run was over, Collins had committed his third foul and the Zags seemed completely out of sorts. The game was mostly back and forth for the remainder of the half, but the prevailing sentiment was that a close game down the stretch would ultimately turn toward the Tar Heels. And that’s exactly what happened. 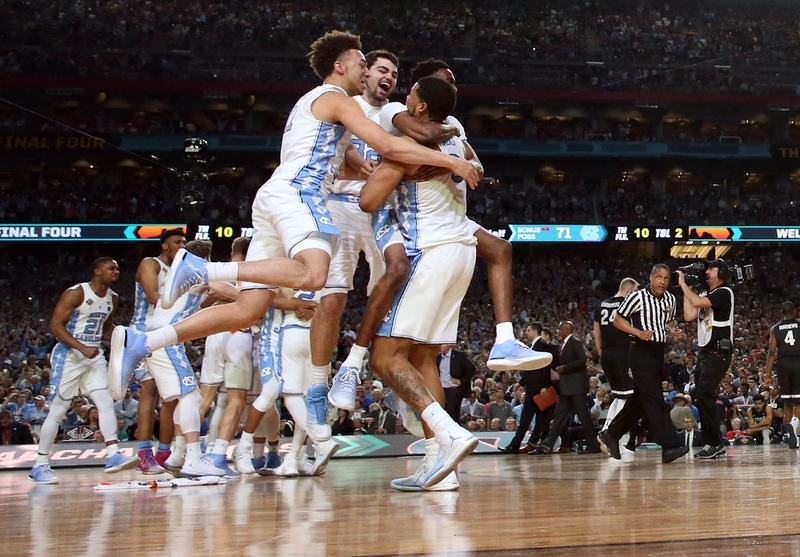 North Carolina made a habit of closing strong in the year’s NCAA Tournament, and another late run — this time 8-0 over the last 1:53 — finished off the game and the Tar Heel’s sixth National Championship. Again, Survive. North Carolina certainly showed its moxie in repeatedly surviving and advancing throughout this year’s NCAA Tournament. First, the 12-0 run that vanquished Arkansas in the Round of 32. Survive. Next, another 12-0 run, followed by a wild Kentucky answer to tie the game but was subsequently rendered moot by Luke Maye’s Elite Eight dagger. Advance. 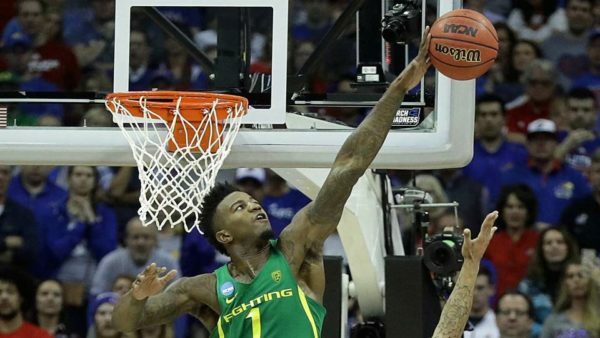 Then there was the wild sequence of missed free throws and offensive rebounds that eliminated Oregon. Again, survive. And tonight’s whatever-that-was kind of game, which ultimately was the sort of slugfest that softer teams than these Tar Heels typically lose. After six wins, there’s no further advancement available other than to fly back to Chapel Hill and put some more hardware in an already overflowing trophy case. Survive and advance. Ugly, Ugly, Ugly. It’s unfortunate that one of the top storylines exiting a National Championship game is just how poorly both teams played. The officiating was also once again an issue, with multiple missed calls and a surplus of fouls (44) whistled, grinding the game to an ugly halt (27 in the second half). Still, much of the visual pain came from the teams’ non-championship caliber product on the floor. The Zags shot 33.9 percent from the floor; the Heels 35.6 percent; and despite all the fouling, both teams combined to leave 20 points at the free throw line. Gonzaga’s usually sure-handed offense — ranking among the top 40 nationally in turnover percentage — gave the ball away 14 times, several of which were completely unforced. Perhaps the most fitting bookends to a second half as ugly as tonight was that North Carolina both started and ended the half with a breakaway bucket coming from a Gonzaga turnover. 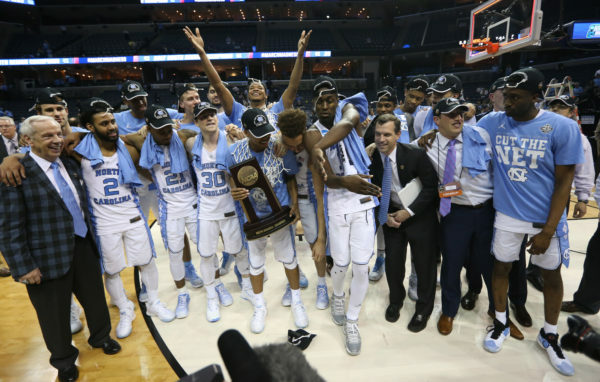 North Carolina proved to be the better team and their fans partying on Franklin Street certainly don’t care how they got there, but it wasn’t a virtuoso performance by either team befitting a title bout. Roy Williams’ Legacy. When North Carolina gave Matt Doherty the boot in 2003 after three shaky seasons, the school’s hope was that prodigal son Roy Williams would return to Chapel Hill and rebuild the legacy of the proud program — Dean Smith’s program. It’s safe to say that the 66-year old has exceeded all expectations. With his third National Championship in the last 14 seasons, he has not only doubled the total number of titles residing in Chapel Hill, but he has also exceeded the total of his mentor and all-around deity in the Tar Heel State, Coach Smith (two). Just like his former boss, there was a time when Williams “couldn’t win the big one.” From 1989-2003, Williams’ Kansas teams were always very good — going to the Final Four on four separate occasions but failing each time to bring the hardware back to Lawrence. My, how things have certainly changed. With his third title tonight, Williams has joined a group of only five other coaches — John Wooden (10), Mike Krzyzewski (5), Adolph Rupp (4), Jim Calhoun (3), and Bobby Knight (3) — at the top of the coaching heap. Furthermore, he has the strongest resume of any coach of the last 15 years — Coach K included — and he has done so on the backs of players who are not considered talented enough to become one-and-done material. His energy and fire suggests that he’s not done yet, either. Gonzaga’s Legacy. Duke lost its first four National Championship games before finally breaking through in 1991. Georgetown lost its first two before getting it done in 1984. North Carolina’s own Dean Smith lost his first three title bouts before Michael Jordan’s jumper dropped through the net in 1982. The point here is that a number of the titans in our sport have had to wait their turns before they captured the brass ring. Gonzaga’s Mark Few is 54 years old and has given no indication that he wants to coach anywhere else. He has made the NCAA Tournament in all 18 years of his career, and there’s no reason to believe that will change anytime soon. Gonzaga will carry a heavy heart for some time over its numerous missed chances tonight, but the Zags are a powerful high-major level program that can recruit and play with anybody. It’s completely reasonable to expect that Few’s team will be back on the Monday night stage sooner than later. For this kind of program, that should be our expectation. It certainly is theirs. Balance, Balance, Balance. There are many good reasons why Gonzaga is now sitting at 37-1 and heading to the National Championship game on Monday night, but one of the best is because of its offensive balance. Nigel Williams-Goss is the proverbial star, but he is truthfully only one of roughly six players who can take the reins for large swaths of a game. The stat sheet shows that four Zags finished tonight’s game in double figures — led by Williams-Goss’ 23 points, five rebounds and six assists — but he, Przemek Karnowski (13 points, five rebounds), Jordan Mathews (12 points on four three-pointers), Zach Collins (14 points, 13 rebounds, six blocks) and even Silas Melson (six points on two three-pointers) all had their moments carrying the team. For the game, the Zags consistently got to their spots against the nation’s second-best defense, shooting 48.3 percent from the field and nearly the same (47.4%) from beyond the arc. In the late second half, Gonzaga was definitely in “hold on” mode as South Carolina made its charge, but for the majority of the game, Mark Few’s preparation and coaching ensured that they would find excellent shots. 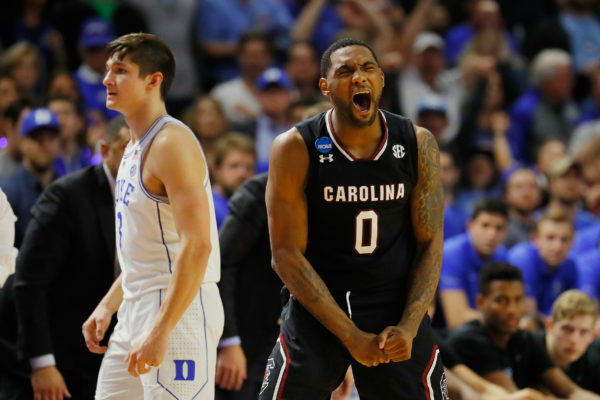 Despite a gutty 16-0 run by the Gamecocks to create all kinds of pressure, they made just enough to advance. Get to Know Zach Collins, America. There’s a reason that the seven-footer has been on NBA Draft boards all season long despite the freshman’s limited usage (43% of available minutes). Seeing a significant opportunity against South Carolina’s undersized frontcourt, Mark Few directed his team to pound the ball inside early and often. With Collins and Przemek Karnowski repeatedly frustrating the Gamecocks’ interior defense with post moves and kickouts to open shooters, the Zags were able to build a large lead that turned out to be just enough to hold on. Collins has an advanced post game for his age and his six rejections shows that he’s certainly no slouch on the other end of the floor either. With a showing like this, expect the freshman to become the first one-and-done player in Gonzaga history. Frank Martin’s Postgame Press Conference. Normally we leave it to the Quotable section below to describe the key moments from the postgame press conference. Not tonight. 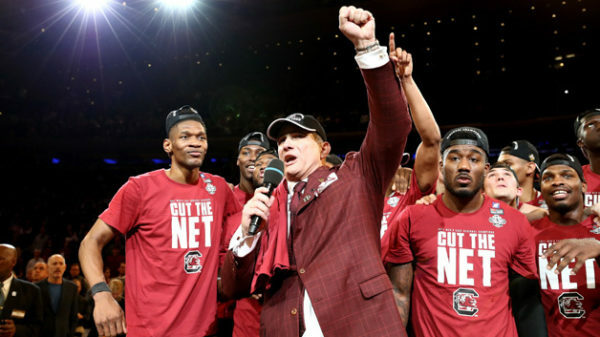 During Frank Martin’s time on the dais, he was asked a question by a reporter about how impactful his team’s run had been to the youngsters watching back in the Palmetto State. Martin immediately went quiet, not saying a single word for a long 10 to 15 seconds. You could hear a pin drop in that room as the normally stoic head coach was clearly moved to tears. When he finally spoke, all eyes were on him. He spoke like a proud but hurt father speaking about his children — a poignant and revealing moment for a man who loves his players that way, but has had a reputation for fire and brimstone throughout his career. Star of the Game. Zach Collins, Gonzaga. Collins made a comment earlier in the day that he wouldn’t want to be playing himself tonight, and he was certainly prescient in his observation. His 14 points, 13 rebounds and six blocks were felt all over the floor tonight, and it’s unlikely that Gonzaga would still be playing if not for his outstanding effort. Now that we’re down to the Final Four, let’s take a deep dive into each of the four remaining teams. Today: Gonzaga. West Region Champions. 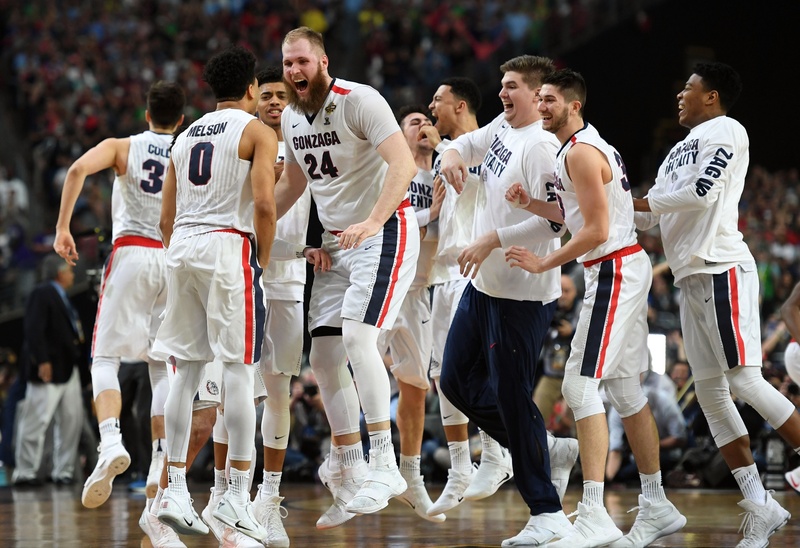 Gonzaga’s road to the program’s first ever Final Four wasn’t especially treacherous, at least as Final Four roads tend to go. Both South Dakota State and Northwestern competed with the Zags for a half, but neither team was built for sustained postseason success. 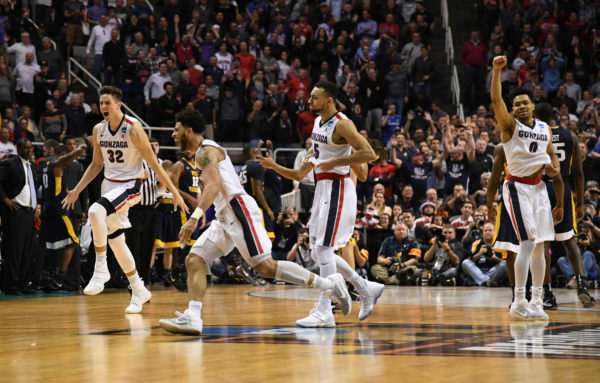 Gonzaga’s most impressive win was surely its Sweet Sixteen triumph over a fourth-seeded West Virginia team good enough to be a #2 seed, as the Bulldogs monopolized key plays down the stretch to escape the Mountaineers. Finally — and with no disrespect to Xavier’s inspired run to the Elite Eight — Gonzaga was handed as easy a regional final match-up as possible, taking care of the 11th-seeded Musketeers in short order. All this isn’t to say Gonzaga’s Final Four appearance is undeserved or not historic – when the best team in the country earns the program’s first appearance in the National Semifinals, it is surely both – but it is also worth noting the relative ease of the Zags’ arrival. Mark Few. Monkey. Off. The. Back. Few can deny the importance of this Final Four appearance all he wants, but if nothing else, he will value it for its ability to remove Final Four drought-related questions from the media’s playbook. If Xavier had beaten the Bulldogs on Saturday, Gonzaga would still be one of the premier programs in America, and Few one of the sport’s greatest coaches. However, a dose of validation is good for anyone every once in a while, and Few now has an amazing opportunity to join an even more exclusive coaching fraternity: National Champions. Now that we’re down to the Final Four, let’s take a deep dive into each of the four remaining teams. Today: North Carolina. South Region Champions. This North Carolina run to the Final Four was equal parts exceedingly easy and excruciatingly difficult. The Tar Heels posted the largest margin of victory in the opening round against Texas Southern, but needed to overcome a five-point deficit in the final three minutes to escape Arkansas just two days later. The Sweet 16 brought a return to relaxation for Heels fans, as UNC exploded out of the gate en route to an “it-wasn’t-even-that-close” 12-point win over Butler. The final step was the hardest, however, as familiar Elite Eight foe Kentucky played the Heels even for 39 minutes and 59.7 seconds. 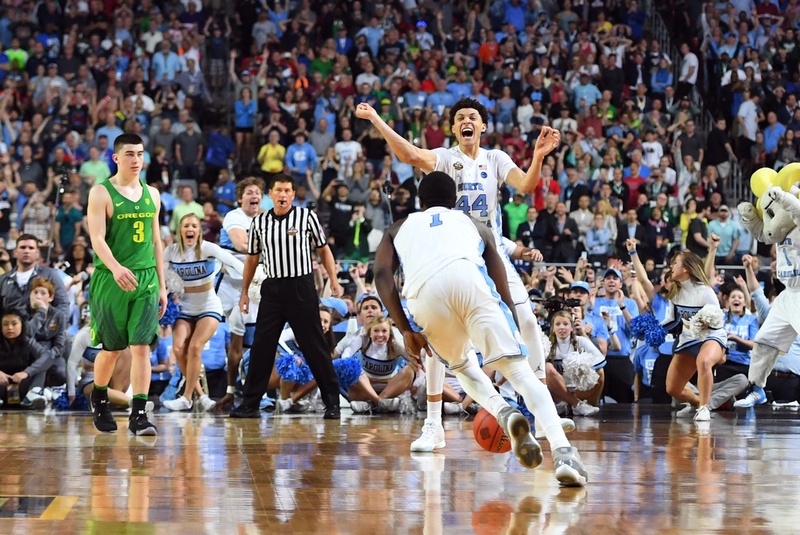 Those finals tenths of a second are now history, of course, as Luke Maye propelled Carolina to another Final Four with his dramatic game-winner. Roy Williams. The UNC head man owns all eight of the career Final Four appearances (prior to this one) among the quartet of coaches still alive. He also earned a rare bit of praise for his timeout-avoidant tendencies last weekend, as it was Roy’s reticence to stop his offense that allowed Carolina to race down the court and beat an unsettled Kentucky defense for Maye’s game-winner. Few, Altman, and Martin have all been around and are respected coaches, but Williams’ experience sets him apart from his peers on the opposing sidelines in this Final Four. Whether or not it proves decisive is anyone’s guess, but Carolina fans should feel comfortable in the knowledge that Williams knows both his team and this stage better than anyone. The speed and efficiency of Carolina’s offense is well known as a Tar Heel strength, and deservedly so. UNC ranks 6th nationally in overall offensive efficiency, leads the country in offensive rebounding percentage, and has no problem playing fast, finishing possessions in an average of 15.4 seconds (22nd quickest in the country). The balanced Tar Heel offense is headlined by AP All-American Justin Jackson (18.2 PPG, UNC-record 99 3PM), but fellow upperclassmen Joel Berry II, Kennedy Meeks, and Isaiah Hicks all join Jackson in averaging double-figure points per game. It’s an explosive offense, surely, but UNC’s success has been predicated off work on both ends of the floor. Amazingly, Williams’ bunch has been able to slow opponents down even while playing offense at a breakneck speed: Carolina foes average 17.8 seconds per possession, good for 272nd slowest in the nation. The underrated Tar Heel defense was on display in the South regional final against Kentucky, as Jackson and company harassed Malik Monk and De’Aaron Fox into a combined 9-23 shooting from the field. A similar assignment will await in Phoenix, as Dillon Brooks and Tyler Dorsey are likely to draw the bulk of the Carolina defensive attention. On paper, there’s no reason why Carolina, the 17th most efficient defensive team in the nation (one slot above Oregon), won’t be up to the challenge. First half foul trouble and questionable officiating. Kentucky clawed its way back into this game in the second half, but early foul trouble and a tough first half whistle greatly imperiled the Wildcats’ bid to advance to another Final Four. De’Aaron Fox watched 75 percent of the first half from the sideline after picking up two early fouls, and backcourt mate Malik Monk joined him there later in the half after also picking up his second foul. There were also a number of questionable first half calls that seemed to go North Carolina’s way every time, including a Bam Adebayo tip-in that was ruled offensive goaltending. North Carolina emerges as a deserving victor, but Kentucky wasn’t helped at all by the first half whistle. Where was the offense? After the Tar Heels and Wildcats combined for 203 total regulation points in December, there was going to be an offensive come-down. However, few could have expected the drop-off in combined offensive efficiency to be so severe. The two teams combined to shoot just 44 percent from the floor, 29 percent from three-point range, and 67 percent from the free throw line. We have seen far uglier offensive games in this NCAA Tournament, for certain, but the early season wizardry in Las Vegas delivered by these teams allowed us to dream of a more explosive, uptempo battle than what played out. Justin Jackson and Malik Monk duel. The individual match-up between Monk and Justin Jackson was much discussed before action tipped, and with good reason. These two stars combined for 81 points in the first game, and each player has repeatedly showed the ability to single-handedly take over games. No such dominance was on display today, however, as Jackson harassed Monk into a quiet 12-point afternoon. The UNC star wasn’t at his best today, but his two-way effort (he had 19 points on the other end) gave him the edge in this decisive matchup. Star of the Game. Luke Maye, North Carolina. Maye posted an unlikely but casual double-double on Friday (16 points, 12 rebounds), yet saved plenty of energy for a memorable encore. He made six of his nine field goal attempts en route to a 17-point night, including the game-winning jumper just before the final horn that won’t soon be forgotten by North Carolina fans. 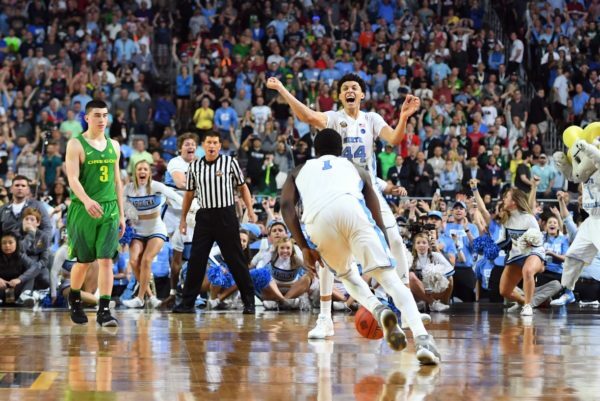 Maye played with swagger and energy all afternoon, and ultimately it was his contributions that pushed the Tar Heels into next weekend’s Final Four in Glendale. RTC will be providing coverage of the NCAA Tournament from start to finish. Justin Kundrat (@justinkundrat) is in New York City this weekend. The story of the NCAA Tournament remains the Gamecocks’ offensive turnaround. All season long, Frank Martin’s group subsisted on its stingy defense to compensate for a pedestrian offense. In conference play, South Carolina averaged an average 1.00 points per possession, good for 11th in the SEC. But Greenville and New York City have been much kinder: In its four-game run to the Final Four, this metric has ballooned to 1.16 PPP. This boon can be attributed to a greater degree of success on the offensive glass, thereby generating higher percentage shots around the rim and incremental opportunities at the free throw line. Against a stout defensive team in Florida, South Carolina scored 42 of its 77 points in the paint, with an additional 23 points coming at the free throw line. In a rare turn of events, South Carolina’s defense was exposed and looked beatable in the first half. The lightning quick Florida backcourt was largely neutralized, something the Gamecocks have been doing all season via ball pressure and jumping the passing lanes. So even though Mike White’s team committed 16 turnovers, Florida’s multifaceted offense proved effective throughout most of the game. 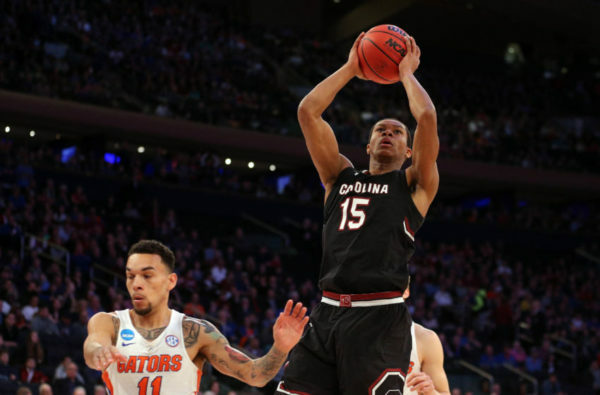 The pick-and-roll offense forced South Carolina to send help to the paint, tacking fouls onto Chris Silva and leaving them exposed on the perimeter. As such, Florida wings Devin Robinson and Justin Leon had countless open looks, but could not convert on enough down the stretch to compensate; the Gators went a miserable 0-for-14 from three in the second half. SEC country is everywhere, and it’s not just limited to football. There were some comments after the first game on the surprising turnout from South Carolina fans for a basketball game in New York City. 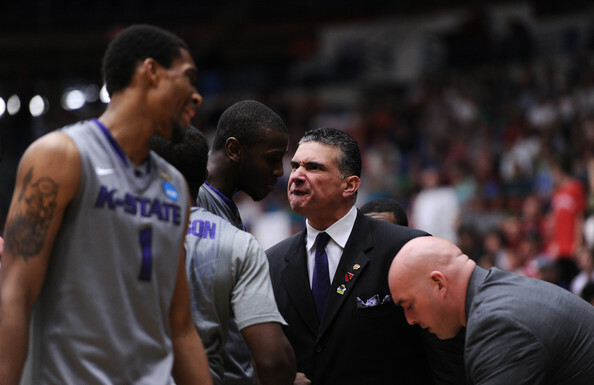 Naturally, Frank Martin was quick to challenge the surprising nature of it. Bandwagon fans or not, the collective attendance from Gamecock and Gator fans here this weekend certainly changed a common perception about the SEC. Like their football counterparts, they too can bring any basketball stadium to life.